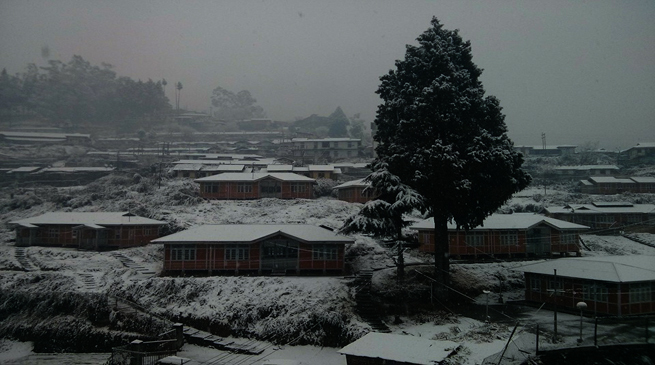 Bomdila and Tawang have witnessed heavy snowfall in Arunachal Pradesh with temperatures dipping to subzero level, informed by so many our readers and face book friends from this region of Arunachal Pradesh. they have posted so many lovely photograpsh in their face book wall. According to face book friends the Bomdila-Tawang road was covered with more than one feet of snow for the last few days. The road goes up to BUMLA , China border and considered as a lifeline of the Indian Army. The road has been blocked completely and it would take a few days to clear the snow. Though with the heavy snow fall tourists are thrilled but the life of the local tribal people have become miserable with chilling winds. This time, the state has been witnessing a cold wave situating for the last few weeks, which has thrown local life out of gear. The entire Twang valley is presently covered with a thick blanket of snow and whole of Arunachal is going to be gripped with unusual long spell of cold wave this time, it has been predicted.